RHYTHM OF THE NEEDLES: What Is Your Royal Guest Name? It's Royal Wedding week and I'm looking forward to it. I'm not going to get up at 2am on Friday, but I'll be recording the wedding to watch at a more reasonable time. I'm one of those who likes the Royal Family. They're one of my favorite dysfunctional families. The Royals are fun to watch, but I certainly wouldn't want to be one. I found this on Ravelry and it's a good way to start this week. What is your Royal guest name? 1. Start with either "Lord" or "Lady". 2. Your first name will be the name of one of your grandparents. 3. Your last name will be the name of your first pet. 4. Your location is the name of the street that you grew up on. I’d be Lady Florence Paula of York. That sounds almost okay, but not quite! By the way, Paula was my cat, one of a litter of four, 2 males and 2 females. The other kittens were Georgia, Ringo and John. Obviously this was in the late 60s. And speaking of names, I've renamed my Sock Yarn Blankie to be the O.S.Y. Afghan (oh-see). It's an acronym for Only Stash Yarn. I don't mind if the yarn is from my stash, or generously donated by someone else. The bottom line is that no new yarn will be added to the afghan. It's a very addictive project and, already, I have completed 14 blocks - with many, many more to go. Some of the ends have been woven in. The rest were tucked under for the photo. 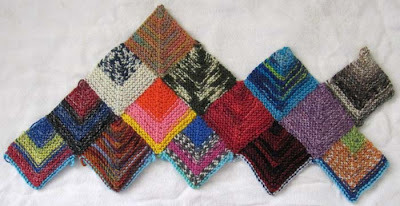 As for my Triangle Squares cushion, I have now completed 5 rows of blocks with ends woven in. That means it's 31.25% finished. These two projects represent a lot of color-knitting. I like that. Too funny!!! My royal name is Lady Margret Kitter of Rout 8. My first pet was a kitten and at first we called him Kit Kat after the candy bar but, then shorten it to Kitter. I love your blanket and when I have knitted enough to have a substantial stash I will make this blanket. I am just now knitting again so I have very little in stash.